The route follows the National Trust’s Clytha Park Estate circular route and is well signposted. 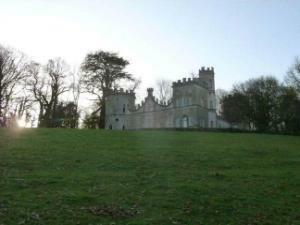 Points of interest include the park and gardens along with the views of the house and Clytha Castle folly overlooking the park giving fine views. The folly was built by William Jones of Clytha House as a memorial to his “most excellent” wife in the 1790s. No public toilets or other facilities available on walk. Good paths across farmland and through woodland. Gentle ascent to Clytha Castle. Bus number 83 (Abergavenny to Monmouth) stops near the Clytha Arms.